Background: Antifouling paints are widely used for the prevention of growth and development of fouling organisms (biofouling). Consequently, nowadays they are one of the main sources of marine pollution. Objective: The present study examines and compares two different extraction techniques, for the determination of diuron and irgarol 1051 in shellfish tissues. 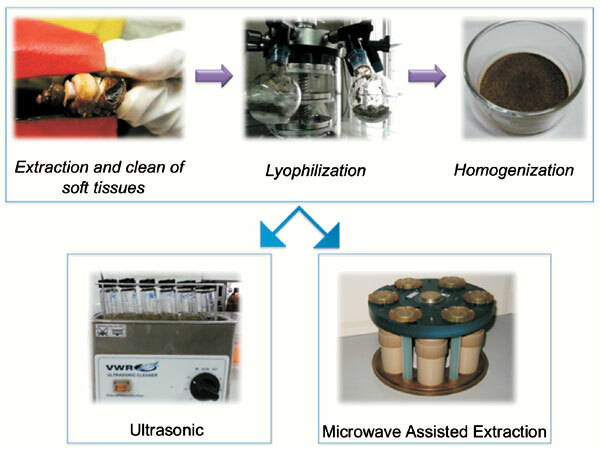 Method: Microwave assisted extraction and ultrasound extraction, followed by liquid chromatography with tandem mass spectrometry were tested and different parameters for both extraction methods were optimized. Results: The results showed that microwave assisted extraction was the most effective method, presenting recoveries in the range of 51.2 to 69.4% and 76.0 to 92.8% for diuron and irgarol 1051, respectively. The precision was evaluated in terms of repeatability for different concentration levels (50, and 500 ng·g-1 of both analytes), which was lower than 19.1% (n = 6) in all cases. The applicability of the proposed method was evaluated by the extraction and determination of the target analytes in different mollusc species collected from Spain and Brazil beaches. Conclusion: The proposed method provides good results in terms of sensitivity, extraction efficiencies and precision and it could be employed for future monitoring studies in ecosystems influenced by the port traffic. Keywords: Antifoulings, marine pollution, ultrasound extraction, microwave assisted extraction, diuron, irgarol 1051. Keywords:Antifoulings, marine pollution, ultrasound extraction, microwave assisted extraction, diuron, irgarol 1051. Abstract:Background: Antifouling paints are widely used for the prevention of growth and development of fouling organisms (biofouling). Consequently, nowadays they are one of the main sources of marine pollution.